From the sixth to the eighth century CE, the Buddhist Philosopher paid considerable attention to the issue of the caste-classes. 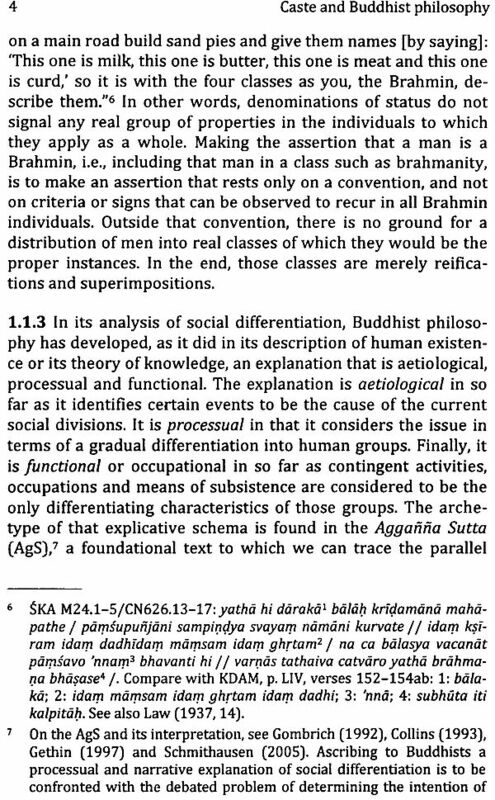 Far from seeking to reform the non-buddhist social environment, they endeavoured to undermine theoretical attempts at “naturalizing” the social statuses, especially Kumarila’s doctrine of the perceptibility of jati. 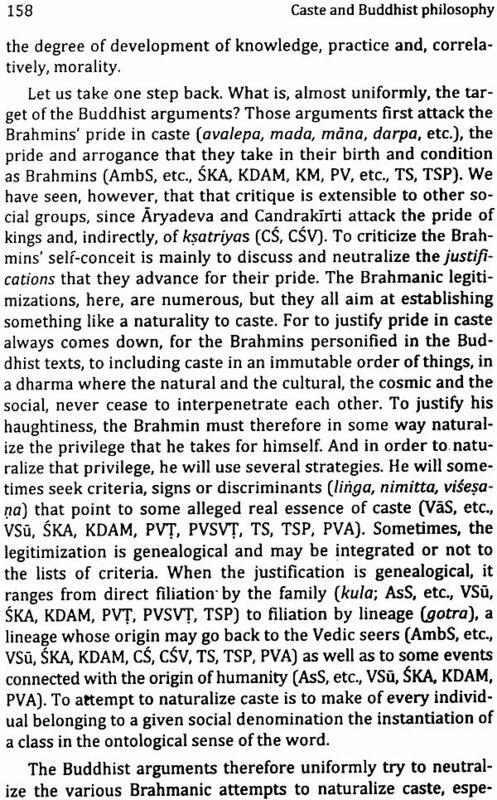 Significant parts of their critique is strongly indebted to earlier, mainly caonical arguments shaped in order to neutralize the Brhahmins’ pride in caste. 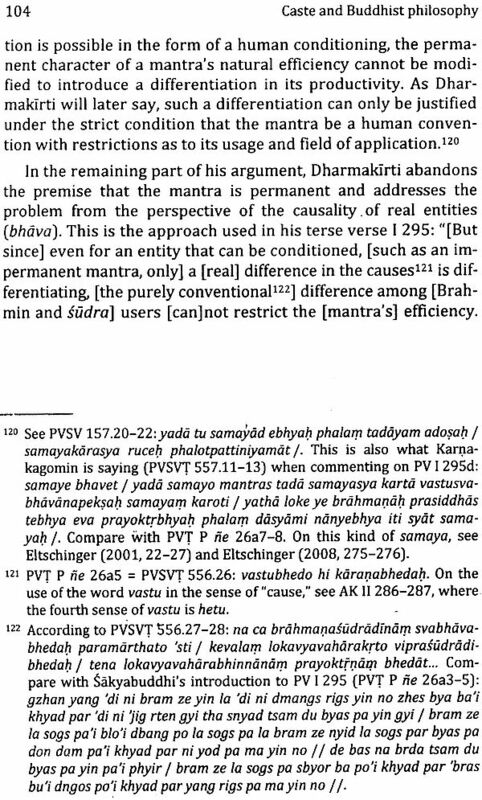 But closer scrutiny also reveals the innovations that were made possible by the renewal of Buddhist semantics around the so-called apoha (“exclusion”) theory. 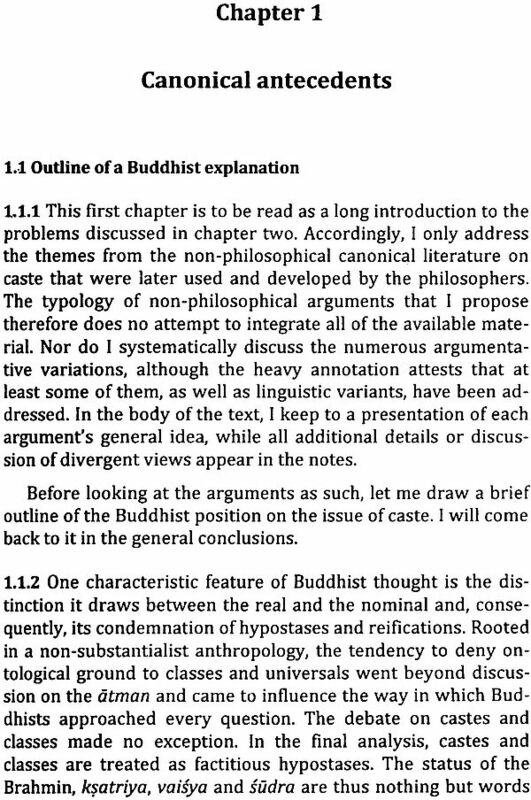 Eltschinger’s study presents the gist of the early Buddhist arguments, the modalities of their appropriation by the later philosophers as well as the new developments induced by the epistemologists. Vincent Eltschinger has studied and taught at the University of Lausanne and is now a research fellow at the Austrian Academy of Sciences. His many books and articles bear on the religious and apologetic dimensions of late Indian Buddhist philosophy as well as on the religion philosophical interaction between Buddhism and Brhamanical orthodoxy. 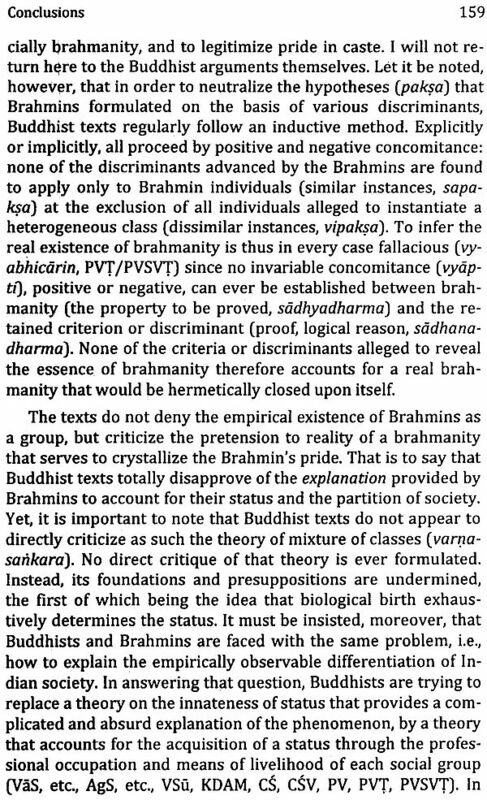 The rigorous denial by the Buddha and his followers of the Brahmanic idea of castes as a natural fact is a well-known detail in the long history of the study of India's social structures and their ideological background. From early canonical texts to later philosophical literature, this denial is regularly attested. The early Buddhist positions and refutations have been extensively documented, beginning with the seminal study by Richard Fick (German: Kiel 1897, English: Varanasi 1972). However, with the exception of P. L. Barua, who presents early arguments against caste as a fact of nature, the study of these positions has focussed on the social and historical data they may provide. Until now, the later systematic and post-systematic developments in Buddhist philosophical traditions have not been taken into consideration, It is these that are the focus of this volume. 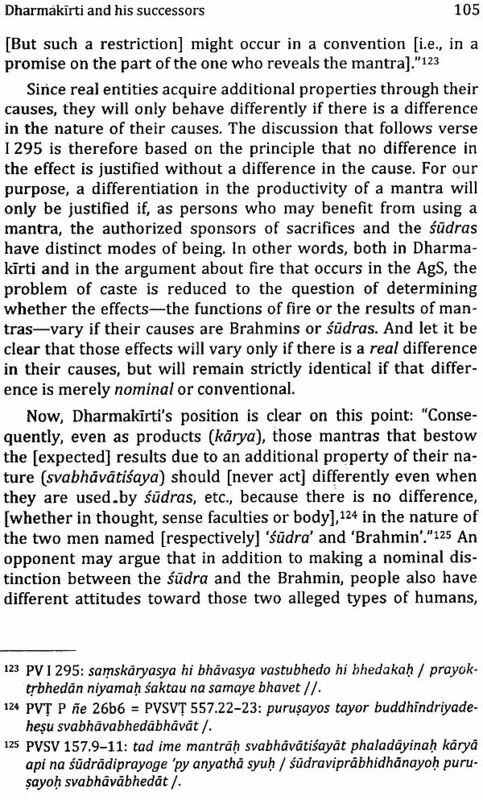 The author offers a detailed analysis of the arguments against the Brahmanic "naturalization of caste," as propounded by Dharmakirti (ca. 600 CE) and his successors up to Prajfiakaragupta (ca. 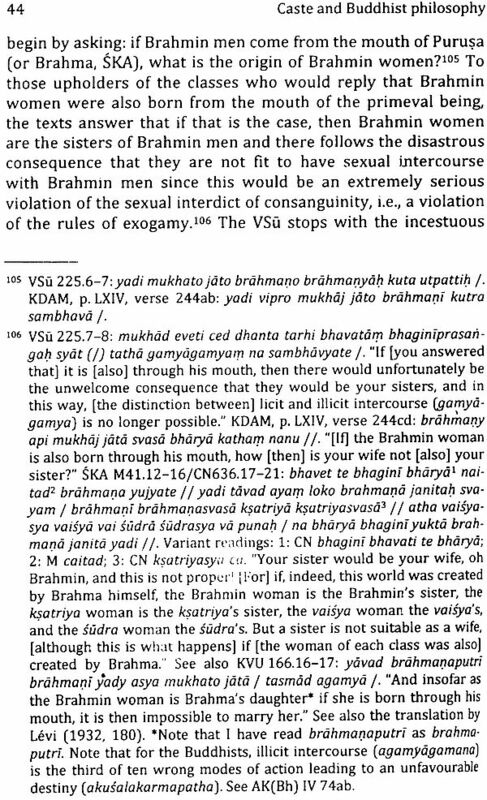 800 CE), and in the process pays close attention to their historical context as exemplified by the writings of Aryadeva, Vasubandhu, Dharrnapala, and Candrakirti. The first section provides a survey of the canonical material in relevant Pali Suttas and subsequent Avadana and [ataka literature. This introduces the reader to the sources for the arguments concerning caste, both against caste as a natural fact and for caste as an outcome of social conventions. 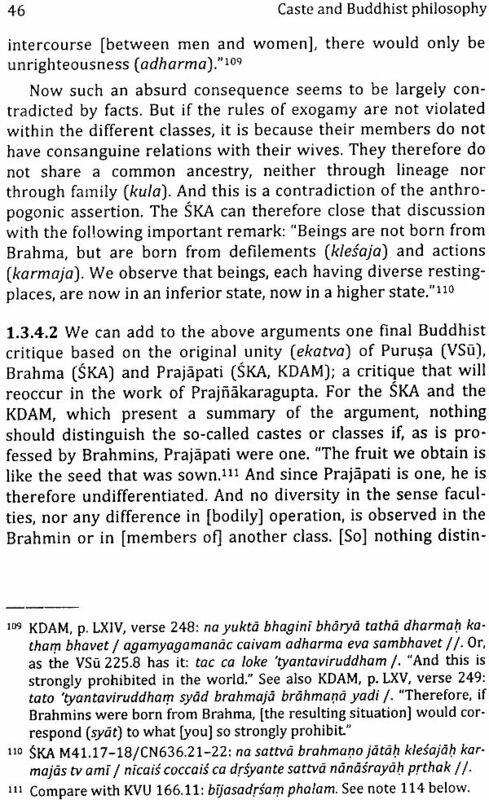 Arguing from biological and genealogical standpoints, and pointing to the instability of brahmanity as a social category, these early materials reject that "brahmanity" is a natural given. While it is evident that one objective of these early sources was to proselytize, the attempts to systematize the Buddha's teachings in the different scholastic Abhidharmas were in the main intent on doctrinal clarifications within the various Buddhist groups. The question whether castes are a natural given rather than a social construct was only of marginal interest. In the sixth and seventh centuries, however, with Dharmapala and Dharrnakirti and his contemporary Candrakirti. Buddhist scholasticism increasingly confronted non-Buddhist traditions. 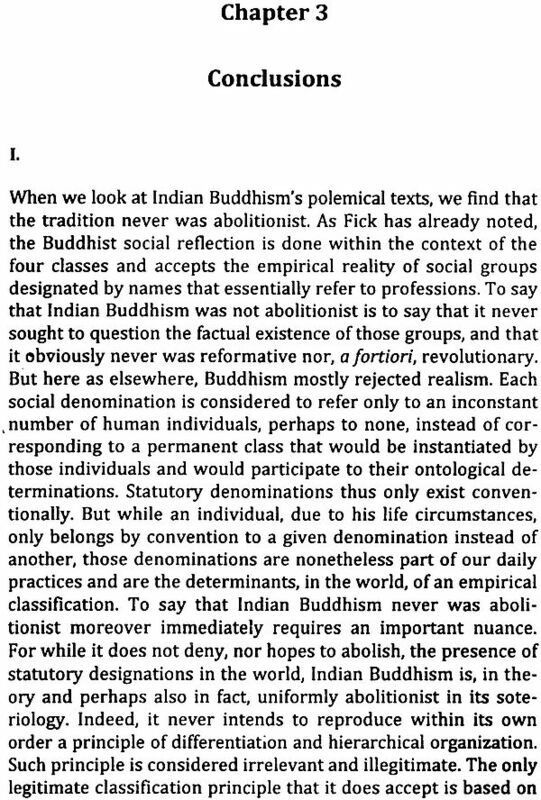 As a result Buddhist polemics against the innateness of caste were provided with a more rigorous philosophical foundation. 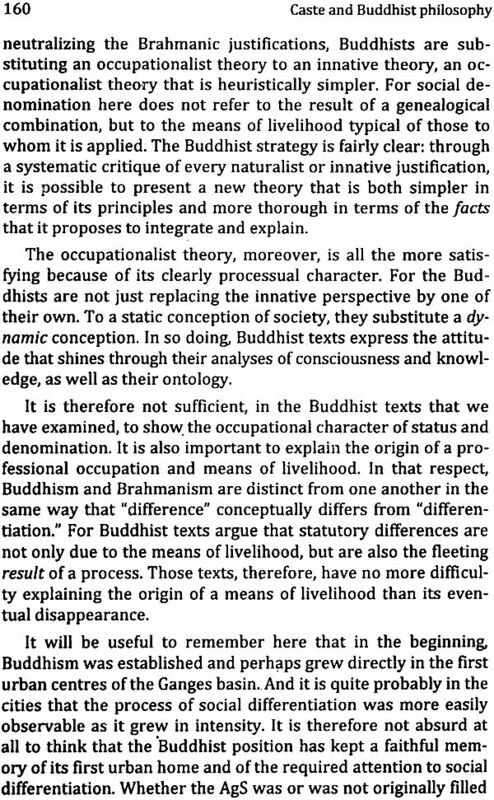 Dharmakirtf in particular "was the first to move the polemic to the level of epistemology and ontology" (p. 59). 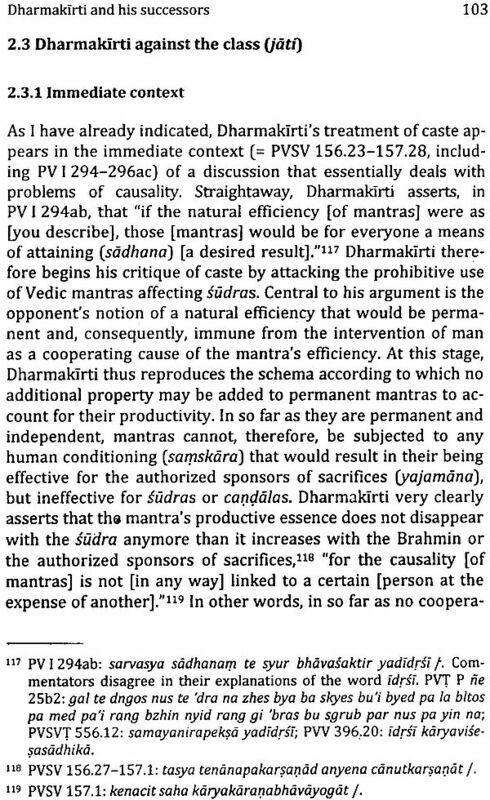 This transformed the traditional reasoning into strict arguments formed in terms of the standards Dharmakirti had shaped in his ontology, epistemology and logic . 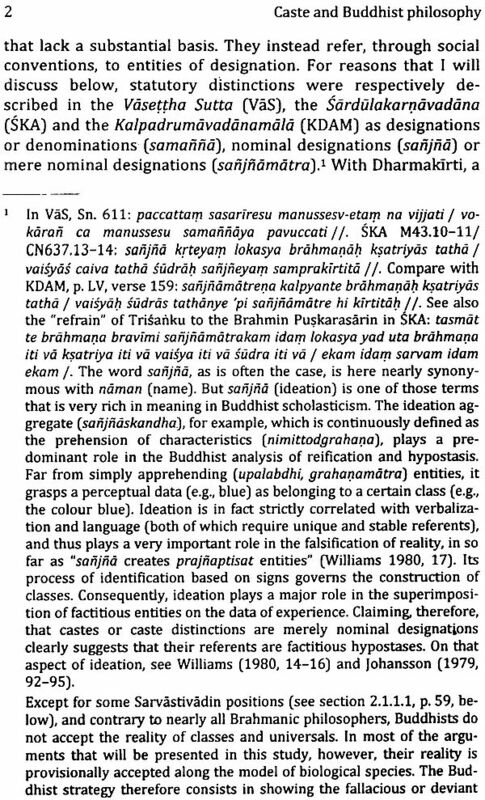 The main part of the book presents the final stage in the evolution of polemics against the "naturalization" of caste in the sense of "any attempt to include caste among the things that do not depend or proceed exclusively from human thought and arbitrary conventions, i.e., to consider caste as agreeing with nature' and not merely with people's social and linguistic habits" (p. xix). 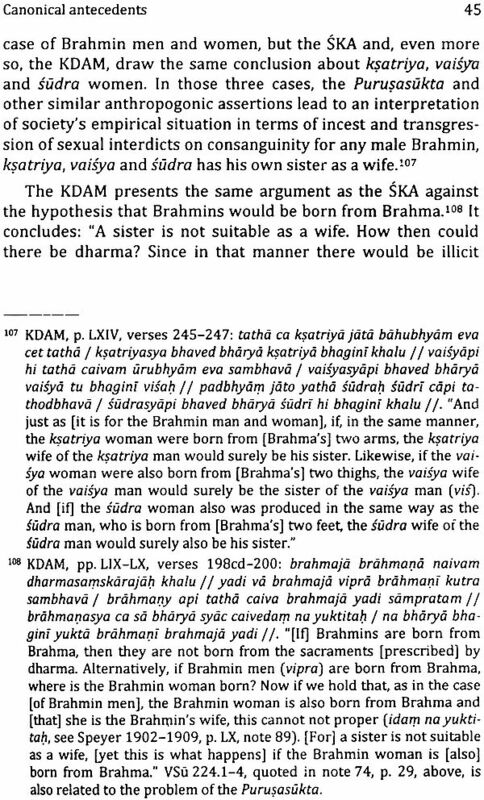 This section focuses on the arguments of Dharrnakirti. 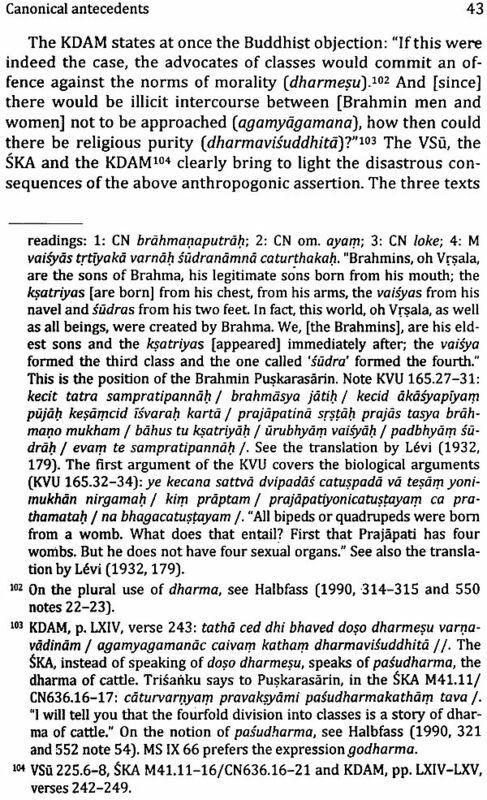 These are set into the context of pre- and post-Dharrnakirtian Buddhist voices, including Vasubandhu, Aryadeva, Candrakirti, Dharrnapala, Dharmakirti's commentators Sakyabuddhi, Kamakagomin and Prajfiakaragupta, as well as Santara~ita and Kamalasila, Representing the Brahmanic opposition, the Mimamsaka Kumarila was in all likelihood Dharmakirti's main opponent for his arguments concerning the perceptibility of distinct classes. 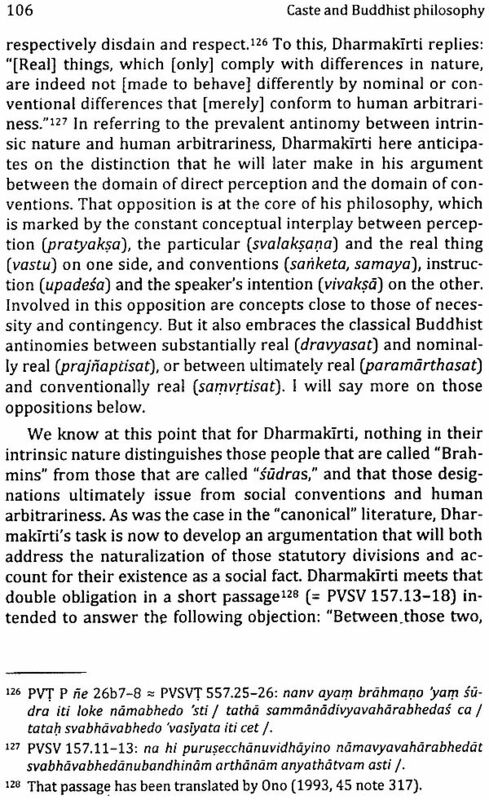 Internally, Dharmakirti's arguments are found in the context of his explanations concerning nominalistic ontology and linguistic theory. This is because he does not separate the problem of caste from that of universals in general. Throughout the volume, these steps are carefully attested with clear translations and textual documentation. Wrapping up the results of his study, the author's conclusions draw a succinct picture of the Buddhist position on caste, gained through the broader understanding of the historical and social facts and changes that took place during the periods these documents were created. 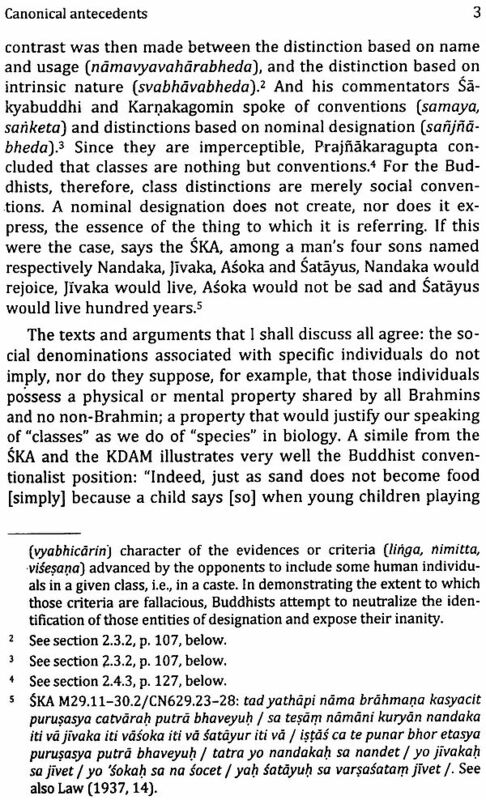 Moreover, in considering the validity of his study for present-day India, the author ventures the opinion that "the vast majority of points raised in the Buddhist argumentations remain a burning question, even today"